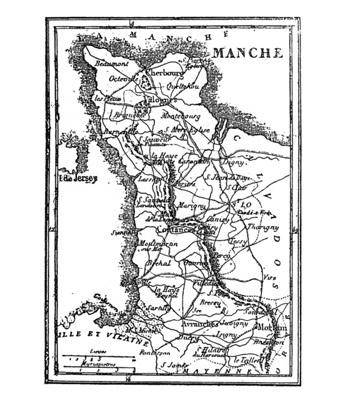 The Department of Manche is divided into two historic zones, Cotentin in its north two thirds and Avranchin in the South. Integral part of the massif Armorican and situated in the west ends of the Norman region, The Cotentin or the peninsula of Cotentin is bounded by the sea in the East, in the North and on the West, and by a big part of easily flooded swamps during the winter periods, situated geographically by the city of Trévières in that of Lessay. The Neolithic period left numerous tracks of human activity such as paths covered with Rocheville, Lithaire, Bretteville in Saire and diverse sites of raised stones. The peninsula of Cotentin was populated by a Gallic tribe Unelli ( Unelles) the cityof which was Cosedia (today Coutances) Avranchin in the South, was populated by Abrincatuii ( Abrincates) having for city Ingena (today Avranches). The region knew multiple vicissitudes throughout his(her,its) period going of period Norman ducale (X ème century) until the Hundred Years’ War (XV ème century) permanent stake enters the crown of England (English activity during 32 years), the dukes of Normandy and the king of France.. Historically Normandy remains nevertheless especially very known for its landing beaches and that of Utah Beach (beach of La Madeleine) on the municipality of Sainte Marie du Mont, the first freed municipality, without forgetting naturally Sainte Mère Église and the parachutings of June 06th, 1944,The Mecca of the tourism of memory. For a long time based on the automobile consumption and thus the subsistence economy without production intended for the export, from XIX ème century appears the development of the dairy breeding which is going to give a strong dynamism to the economy of the region, favoring the growth of villages and industries. The sea transport and the appearance of the railroad are going to help in the growth and the export of the food-processing industry. 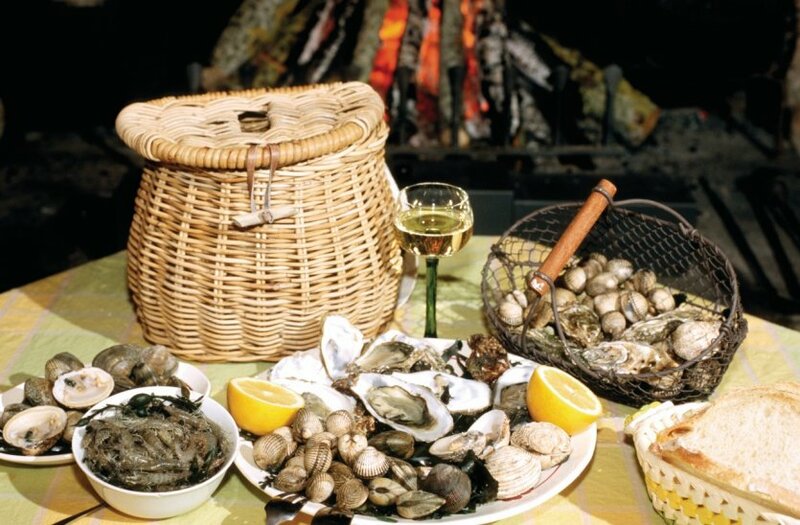 In parallel, the fishing from the shore or the marine fishing, as well as the shellfish farming (breeding of oysters and molds) are activities anchored well in the local tradition. The region presents a surprising variety of landscapes as well as a beautiful architectural wealth. First of all in the South the bay and its Mont St-Michel, world-famous inescapable place, a little more in lands, city of Mortain and his waterfalls, then by going back up the west coast Granville and his surroundings of which the abbey of Hambye. We arrive then on the region of Coutances, the city dominated by a magnificent cathedral. In the center of the department is the city of Saint Lô, administrative city, prefecture of Manche. Very hard felt during the summer, 1944 the “capital of ruins” in nevertheless managed to protect his ramparts of XI ème century. In the North of Saint Lô we arrive in the zone of swamps extending since the city of Lessay up to the mouth of the Ledge and the baie des Veys. A regional natural reserve is managed by the city of Carentan there and proposes diverse circuits of discoveries on foot or by boat. By going back up the quotation is after Carentan is situated the beach of Utah Beach and in the North is is the region of the Valley of Saire. Very appreciated the cities of St Vaast la Houge and his Tatihou Island, also Barfleur and nearby the lighthouse of Gatteville, second higher lighthouse of Europe. The city Of Cherbourg, everything in the North, possesses the biggest artificial natural harbour of the world, known for its City of the Sea situated in the maritime former station, and proposes diverse playful studios without forgetting an abyssal aquarium and the visit of the submarine ” The Formidable ” (Le Redoutable). By continuing the route along the quotation we find in the point northwest Cap de la Hague, landscapes of moors and cliffs, convenient places in hikes with its paths of the customs officers which follow this quotation. If also find there the dunes of Biville and his 350 hectares of protected moors. A big part of the quotations of the region of Hague belong now to the Conservatoire du Littoral, parking of their protection. Cotentin is a region of France which possesses one of largest number of manor houses, often discreetly protected from the view of the curious one but also the numerous vestiges of construction of the period of the Middle Ages, the castles of Gratot, from the River, holy rescuer the Viscount, strong Vauban of st Vaast la Hougue, etc.